Recently I have been having some “relational difficulties” with one of my co-workers. Even though we have the same end-goal in mind for life (I am referring to Heaven), we seem to have very, very, very different ideas about reaching that goal and very, very, very different personalities. I have to work closely with this person on a daily basis and she is also training me to some degree because I am taking over one of the jobs she used to do. In addition, I am new to the community so that adds in the difficulties of getting to know each other from scratch. The other day as I was talking to my mother about my struggles, she told me that this sounds like a case of Martha and Mary. Since she gave me that little insight, I have prayed and thought about what that means and how that knowledge might effect my actions. What I want to share with you are a few of my reflections on how to deal with situations where differences in personality and approaches can often seem to take away from the goals you are trying to achieve. I have found that I need to remind myself constantly that we do indeed have the same goal. 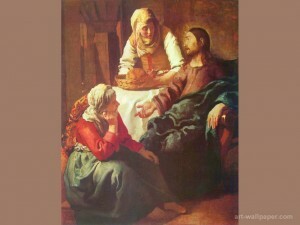 Martha and Mary were both trying to serve and love the Lord; they just had different ideas about how to do that. If we have a common goal, then focusing on that can often help us to remember the bigger picture and to keep us from demonizing the actions of the other person. Her ideas are just different from ours, and maybe we can even find a middle ground sometimes. Marthas can often seem controlling and overbearing to the Marys of the world. The word “seem” is going to be important here. I am most definitely a Mary. I prefer the mode of quiet contemplation and I need to sit and think, going over all the details, before I make a decision. (Now, at times I do react quickly, but it is still very much an internal process for me.) To me, my co-worker’s actions often seem overbearing and rash. I get emotional and worked up over situations, but my emotions are often kept inside. I don’t see the good in reacting quickly to situations, but my co-worker wants to jump on things and get them done. To me, Marthas SEEM to react too quickly and without much thought about the consequences of their actions. What I need to remember is that the Marthas of the world process things outwardly. They seem to be controlling because they are working through the situation (and they might not even realize that they are being too controlling). We need Marthas and Marys in the world. We need both action and contemplation. There can often be friction between these two components of the spiritual life. To the Marys it can seem that the actions of the Marthas are distracting and unnecessary. On the other hand, the seeming inaction of the Marys can be a great source of frustration for the Marthas of the world. In order for these two groups to work together, we all need a dose of humility. Christ says to learn from Him because He is “meek and humble of heart.” We too are called to be meek and humble. This task is going to be difficult for both parties. I am sure there is a lot more we can all learn from this line of thinking, but this is at least enough for me to work on for now. One last thought: Christ did say that Mary had chosen the better part, so that leaves me wondering if the Marys aren’t a little more right in the end. Who Do We Need to Make Room For in Our Inn?